A Kolikkopelit.com player is planning the fishing trip of a lifetime after scooping a mammoth six-figure jackpot on the online casino’s Mega Fortune game. Rauli from northern Finland picked up the €109,751 jackpot on Sunday night after placing a series of €5 stakes. Anne from southern Finland having previously won the most lucrative jackpot ever on the game, €2.6m. Even right now, the game has a jackpot of €1.1m, which is continuing to grow. With his winnings, Rauli plans to pay off some loans before embarking on a fishing trip to remember in Norway. 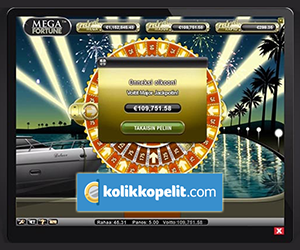 “Everything works brilliantly on Kolikkopelit.com,” said Rauli, who had recommended the online casino to his friends before winning the jackpot. Over 300,000 Finnish players have chosen Kolikkopelit.com as their favorite online casino, making Kolikkopelit one of the biggest brands in the Finnish market. The site offers more than 150 games for desktop and mobile, entertaining localised campaigns, and exclusive content in partnership with well-known brands in Finland such as Kummeli and Vares. Fast payments and professional customer support ensure that the players are happy and trust the site. Kolikkopelit has operated since 2010. Kolikkopelit is part of iGame-group, which also has several other well known brands such as Leijonakasino.com, Veikkaus-, Bingo- and Casinohuone.com, Hertat.com, iGame.com and 24hBet.com.